This lovely Vintage Japanese thread was used for weaving and embroidery. Each skein is 1.5 oz. and is a #2 thread. Each skein has over 1000 meters of thread. After eight years of research I have finally learned how they were made and what they are made of. Although it only deepens the mystery. The silk thread which is the base was coated (laminated) with silver. Once the silver application dried, the thread was placed in a vat of silver oxide and then 24k gold was electroplated onto the silver. The thread, when analysed shows it to be primarily composed of silver. 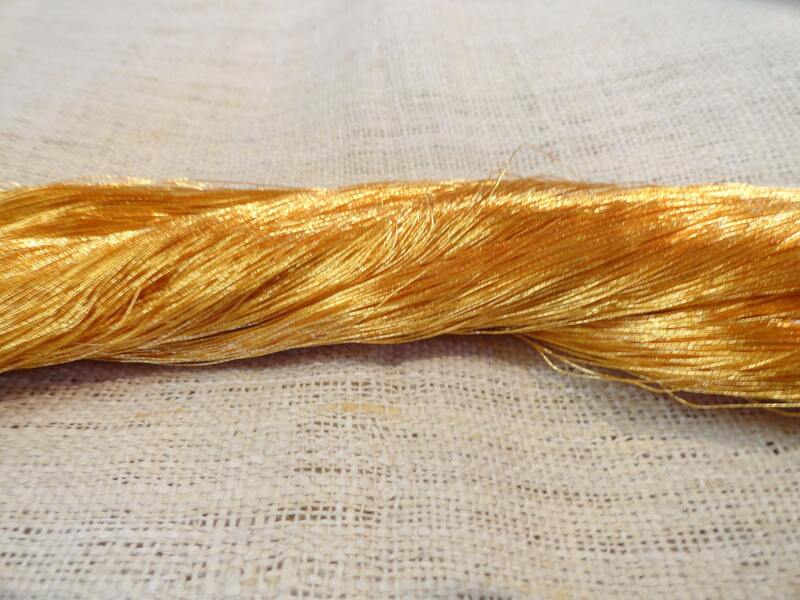 The quantity of 24k gold is far less than that of the silver, but because it is the only metal showing and resists wear or fading, we feel justified as listing it as 24k gold thread. I still have a hard time wrapping my mind around the concept of applying metal to thread. Just like in picture. I haven't decided what to do with it yet. Wonderful vintage product, extremely sweet and seriouss seller! Thank you very much!